Veneer is cut from a log into sheets in varying thickness, down to as thin as 1/40" thick, this allows you to get the look you want. Veneer is also environmentally friendly, with a recycled wood fiber composite core , which offers you a truly resource conscious option. Thanks to its sturdy core, Veneer doors are less susceptible to warping than solid wood doors and can provide a consistent color and grain pattern. Reconstituted Veneers use high quality common wood veneers from responsibly managed forests that are reconstructed to offer a diverse variety of color, grain, and texture options. Now you can get the unique look you want without impacting the world’s exotic forests. 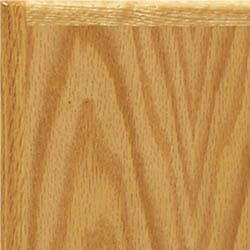 The most popular option is our Aries (93) door featuring a veneer banded edge. We also offer the Emerson (109), Brookhurst (90), and Brookhurst Deluxe (77) door styles with thicker edge band details.